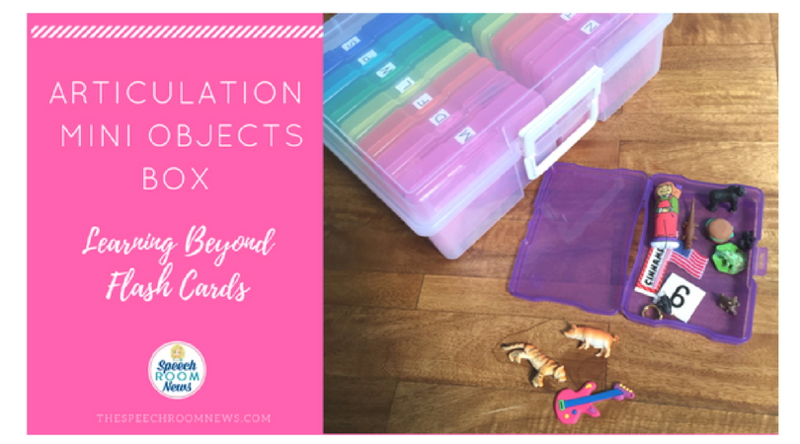 One of my favorite ways to do articulation therapy is to use mini objects. I got myself organized this year so I can take them with me daily into the classrooms I work in. Check out my Vlog below! Do you use mini objects? Leave me a comment and let me know! Yes! It took me a long time to accumulate the mini objects but the kids love them. Love this. Are you going to continue your Play with Purpose vlog on periscope? I missed the one on your Play assessment and haven’t been able to find it.?? Yes! It’s starting up again in September! Mini objects are so versatile for speech and language! Etsy link does not work….nor does searching by name on etsy. ? Thank you so much! You’re so helpful! Looked on Etsy and was unable to locate the items. I’ve had my artic box from Primary concepts for years and have loved using them with my preschoolers. I’ve lost and/or broken some over the years. Thanks for the Etsy link–just purchased the mini bag and it said no duplicates! ? I didnt get the etsy link… can you repost. Thank you!! Lakeshore also offers what I call “Sound Tubs” or Alphabet Tubs.” Each container comes with 6+ objects that begin with that sound. We have added some medial and final objects along the way. These get used almost everyday! I have one too! I love it. I don’t travel as much as you so I use a small nail/screw organizing box to keep mine sorted. Each sound has its own drawer. Do you recommend the trinkets on Etsy or the “I spy” objects? Which grab bag did you buy? I looked at the Etsy site and there are sooo many to choose from. The 200 Trinkets one! No duplicates! I did a version of this, but I put the items into small empty water & soda bottles, along with some filler like used in the I Spy bags, and made myself some I Spy bottles. The kids like turning and shaking the bottles to find all the items inside. I’ve got it sorted by sounds. I used almost all found items – little erasers, items from board games about to get thrown out, tiny accessories long separated from their toys, some little household items, and so on. I spent very little money (though a lot more time) putting them together. This is what I was wanting to do. What kind of filler did you use? Polypellets work the best, rice, or you could try water marbles. They are bright and fun. Yep, that’s what I used. I love my mini objects, though you are inspiring me to keep adding to the collection AND to re-home them as the small tupperwares they’re in are breaking down slowly. I use them most in conjunction with my giant Tupperware container of rice. I hide and the kiddos find. I do that too!! So fun! Thanks for writing! I like the rice idea! Thanks! Amazing idea! I need this type of organization. I have made some small boxes of mini objects for most sounds. The kids enjoy them. I’m still looking to add to my collection. I like the way you have organized yours! So handy to transport. Thanks for sharing. This is very cool, but what did you do with the objects that don’t fit in the containers (i.e., mug, ball)? I have a basket of random stuff I use for language therapy and I threw them in that. I loved this blog post! I’ve been looking into doing something like this and I am glad for all of the advice. On a side note, you mentioned that you now do inclusion with all of your students. Could you maybe elaborate on this in a future blog post? For example, how you do inclusion with your speech groups vs. language groups and especially how you do inclusion with older students? Any advice or suggestions (or just seeing how another SLP does it) would be helpful. Thank you! Your mini box and items look great. In grad school we did basically, the same thing, but we used tubs and filled them with all sized objects that we could find. A year after I started working I did the same thing, I got some decent sized tubs from the Container store and filled them with any item I could find, e.g., trinkets, extra play food or animals, prizes from kids meals, pretty much anything that didn’t take up too much space and could be put in a brown paper bag, a sensory bin or hid around the therapy room. On the top of each box I printed out a paper that separated the contents by initial, medial and final position, 1, 2, and 3+ syllable and then I left space for people to write in so that they could note what they added to the box. I only made tubs for some of the earlier developing sounds. I just started buying some of the toob animals and objects to use for both my speech and language kids. I hide them in colored rice or leaves and they love them. They are bigger objects than these mini boxes, but still a nice size for my little kiddos. Thanks for sharing. It helps me see that I’m on a similar track with my students. Is it possible do buy Rainbow boxes online? The link does not work. Here’s the link to the Michael’s box. It goes on sale pretty often for 50% offf, plus your educator discount, so you can purchase it for around $20. I have done this but with shoe boxes and they take up quite a bit of room but I have the space so it’s okay. Would love to start the mini-versions just for the novelty. Where did you get the containers? If mentioned above, sorry. Someone posted on FB these very boxes from Michaels this past week and people were asking what she planned to do with them. I gathered all of my stuff by asking for donations from kids on my caseload. I’m in a different school now so I don’t know if it would be allowed, I’ll have to ask. I have thought about making mini boxes for artic but it is so hard to accumulate items for the boxes! Do you/ anyone happen to have word lists for items in each box? Awe! Bummer the photo craft keeper is out of stock! Love this idea! Thank you so much for sharing. Do you use the large trinket objects from etsy or the small ones? 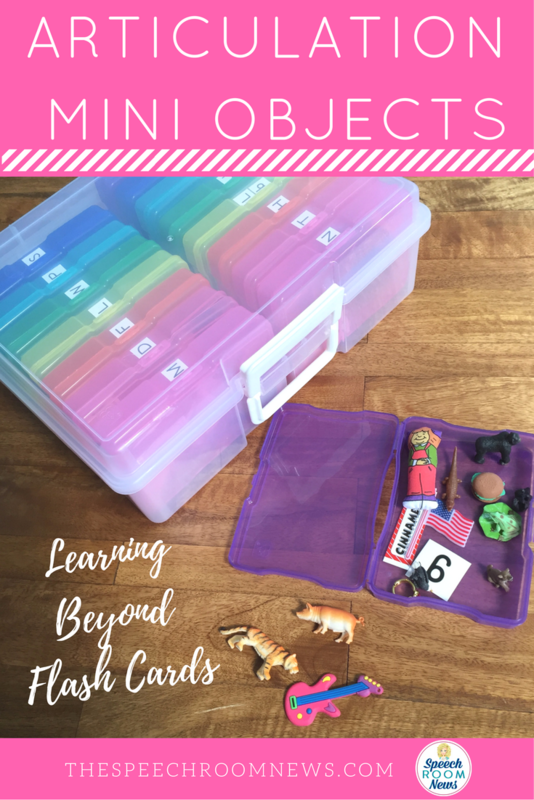 I use mini objects all of the time: sensory bins and with EET. The kids love to just play with them too! I put out the call to my FB friends for mini objects and they came through! I specifically asked for the tiny junk that gathers in the bottom of toy boxes, the Kinder egg surprizes that brought 5 minutes of joy, the tiny vending machine prizes that stopped tantrums and the “beloved” Shopkins that have lost their glow. I have been working as a school S-LP 20+ years, I have played more BINGO, GO FISH, Crocodile Dentist than anyone should. These tiny items have revitalized me! I love them! I have been playing with them for weeks using all sorts of scenarios. Your post has put a big in my ear. I am a preschool teacher who will have kudos that need an extra boost with speech this year. I was wondering which sounds should I start with or should I just work with the letter I am doing. I know that I will be doing a lot of expanding and repeating of words so they can hear and repeat. I just want to help the spearheaded therapist along and not overload the kiddos.